The Church of Jesus Christ of Latter-day Saints, sometimes nicknamed the Mormon Church, is organized as the early Christian Church was organized anciently with apostles of Jesus Christ leading the Church, Quorums of Seventy helping them administer to the needs of Latter-day Saints around the world, and all other offices that existed anciently, with the power and authority to act in the name of Christ. Just as Christ's apostles were called from their worldly vocations (from fishermen, publicans, and physicians) to serve the church, The Church of Jesus Christ of Latter-day Saints has a lay, untrained clergy. Most positions in the Church are temporary, and members are called to serve in those positions part-time, while they continue to work at their normal professions. Some of these callings are very demanding, such as the calling of bishop, the leader of a local congregation of Latter-day Saints, which could have nearly 1,000 members. The head of the Church is Jesus Christ, who directs the Church through revelation to His prophets and apostles, just as He did in ancient times. This gospel and Church are not new, but a restoration of the ancient order. Thus, except for callings that especially relate to life in modernity (like Scouting, activities for teens, etc. ), the callings in the Church are the same as they were when Christ organized His Church during His earthly ministry, with a prophet, apostles, seventies, etc. Mormons don't choose a congregation to attend according to a preference for a certain bishop, or to be with their friends. Church units include branches, which are too small to be wards, shepherded by a branch president and two counselors; wards, which are geographically-organized as single congregations, administered by a bishop and two counselors; stakes, which are groups of wards managed by stake presidencies; then areas, regions, and the world-wide Church. This geographical organization enables a free flow of information and ideas from the bottom-up and the top-down. Home teachers chosen from the male members of the Church to visit assigned families, and visiting teachers chosen from the female members of the Church to visit assigned families, can relay information to leaders when needs arrise, making sure that members have timely assistance in emergencies. General emergencies, such as earthquakes, see Latter-day Saints mobilizing very quickly because of the organization of wards, stakes, areas, and regions. Within each ward, stake, and the Church, there are auxiliary organizations for the men (priesthood quorums), the women (Relief Society), the children (Primary), the female teenagers (Young Women), the male teenagers (priesthood quorums, Boy Scouts, and Young Men organizations, and young single adults (singles wards and now stakes). The world is also divided into units known as missions which are under the direction of mission presidents. Mission presidents are called to serve for a period of three years, and take their families with them to the "mission field." Housing is provided for them while they serve. 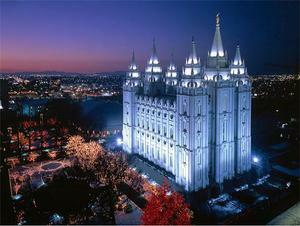 A geographical mission is the area to which Mormon missionaries are called and where they will serve. Missions can be so large that they contain a number of countries, or so small they include only a portion of a city. (The city of Santiago, Chile, is made up of four separate missions.) There are over 300 missions worldwide, and over 50,000 missionaries at any given time. Click on this graphic to enlarge, then click zoom to read. This page was last edited on 4 December 2015, at 00:17.